Fireworks and Grilling… Summer is here! Welcome. 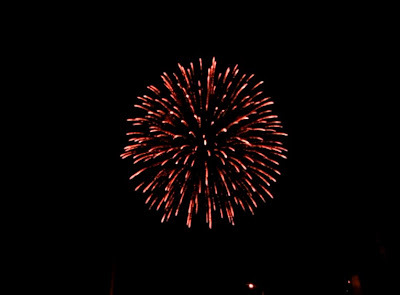 I hope everyone had a fun Fourth of July celebration. Mine started out a little rocky. There’s been a lot going on and life’s been pretty complicated. Dad wasn’t doing too well yesterday and after visiting him, I had a mini meltdown. Sometimes a person is so stressed and down in the dumps that he/she doesn’t want to celebrate anything. You just have to make yourself do it. It’s worth doing. 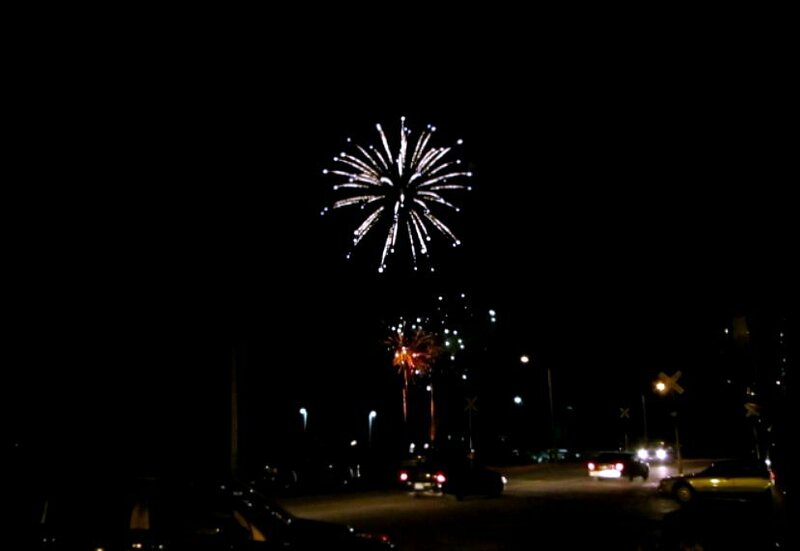 By later in the afternoon, I decided that if I missed the yearly fireworks, it was nobody’s fault but my own. 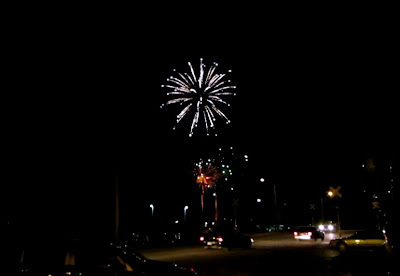 There were plenty of places to view the displays but I chose the one in the town of Hills. It was assumed that the campground would be full… and it was. That’s okay… I prefer camping when it’s quiet. Thankfully, I was there early enough to get a close parking spot on Main Street. The cargo rack on the back of the van was aimed toward the street but I didn’t care… I stood in the road and cooked up some brats and had a picnic right there as the cars went by! Quite a few people waved and one honked. As the sun was setting, it was a great chance to pop up the TV antenna and watch Hell’s Kitchen on the FOX network. As I was closing up the van some young guys in their twenties stopped by and I showed them the van. They thought it was pretty cool. The following are pics of the fireworks show that followed. 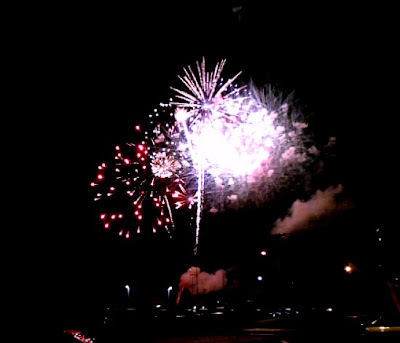 For a small town show, the fireworks presentation was spectacular. To the north, Cedar Rapids has a much larger show but due to the sheer number of people there, navigating is usually a logistical nightmare. Hills’ display was well worth watching and the crowd was just enthusiastic. It’s going to be a tradition from now on! Following the fun, it was time to look for a place to land. Since the campground was full, it was a short hop to the Coralville Wal-Mart for a peaceful night’s sleep. It’s a good stand by and is located right along Interstate 80. This morning the stomach was growling and saying “Feed me!” Just north of Coralville, I headed to a park in North Liberty, a small town between Iowa City and Cedar Rapids. 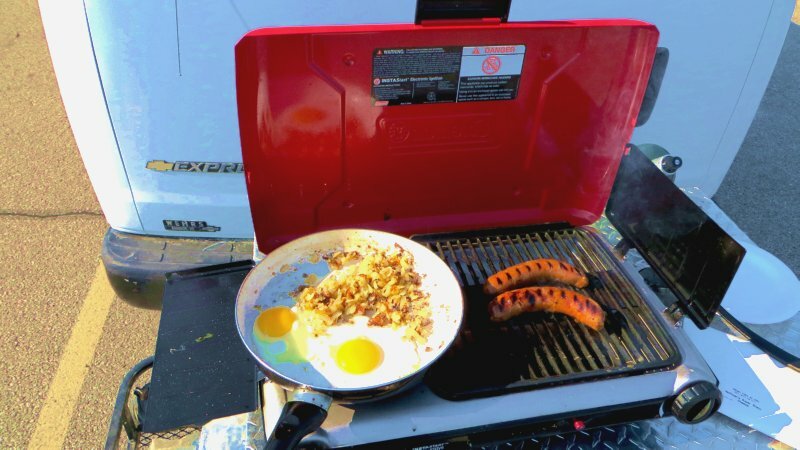 The plan was to cook up a tasty breakfast with the Coleman grill. Unfortunately, just making breakfast was enough to attract some unwanted attention. In their defense, I will say that [having lived there] the North Liberty Police Department works hard to keep their town safe. At times they get a bad rap for being a little too… shall we say proactive? 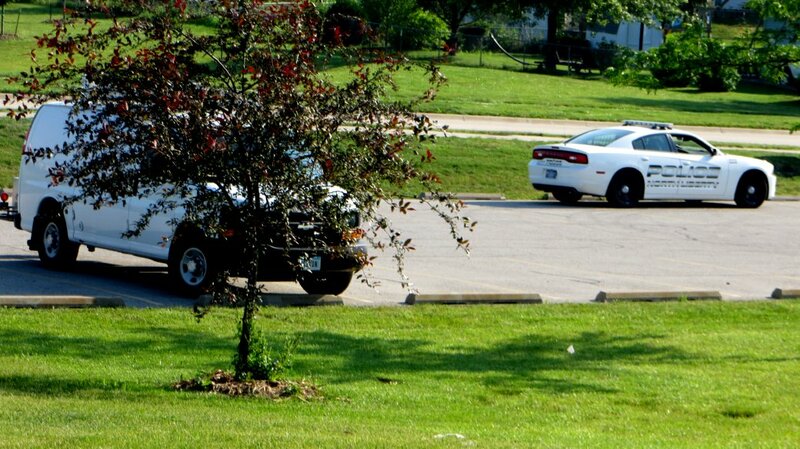 As I was headed into the local park to cook breakfast, a police cruiser followed me in. It appeared that the van was of interest. 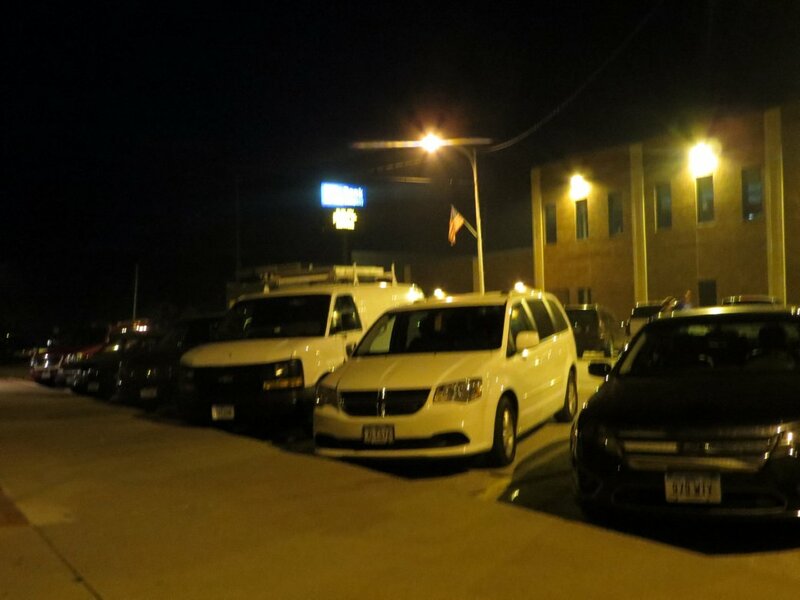 With all of the meth problems in Iowa, one can’t blame the police for wondering about a white van with a large metal box on the back and a guy setting up some kind of heating device. 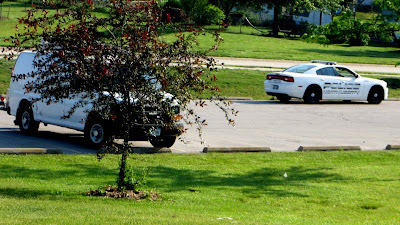 The officer set up a speed trap right by where I was cooking breakfast. I don’t think it was a coincidence even though this is a place where police occasionally watch for speeders. As the eggs, hashbrowns, and Italian sausage links cooked, clouds of smoke billowed from the grill. A lady walking down the sidewalk (by the police car) hollered and said that the food smelled great. 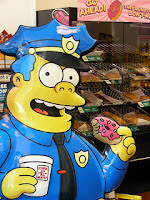 Though I don’t usually poke fun at the police, I would have to think that this grub would be preferable to the stereotypical doughnut. 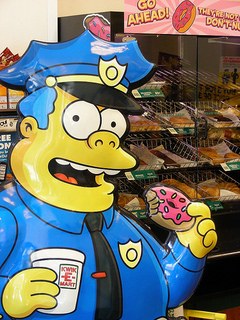 In actuality, few of the police I’ve spoken to eat doughnuts. The ones I know are younger and take fitness seriously, opting for healthier fare. Did being observed by the police bother me? Maybe just a wee bit. But as a van dweller, specifically an occupant of a dreaded “white van”, I don’t mind being seen by the police doing something perfectly legal such as grilling out. I think it helps build good impressions. For all the fellow camping nuts out there, it might be a good idea to keep your cooking booze stowed away in a place such as a cabinet under the bed. I’d left some nasty Pinot Grigio in the door compartment next to the driver and could have gotten a hefty fine! Thankfully, I departed without any contact with the law. A small, fast moving, subcompact car was not so lucky and got a taste of the patriotic colored red, white, and blue light show coming from the police car. I’ll pass on that kind of display! 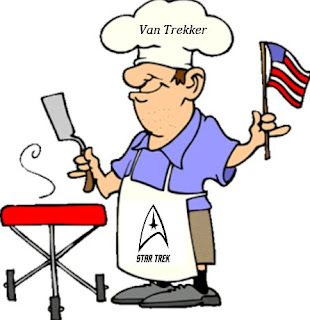 I hope that everyone had a great Fourth of July. A lot of people sacrificed (and still do) to help us keep our freedom. Thanks to all veterans for their service! Have a good one. Enjoy your weekend! True. You have to be careful and do any drinking in moderation. Storage is critical, too. I keep the one shot bottles in the generator box behind the van. It’s legal back there… but not in the cab! I’m thinking about my cargo trailer, but if LEO wants to be a PIA then the park trash can may already be good enough to get you busted. In Calif DWI can cost $10,000 first offense ….. Good thing I don’t drink. I know I guy got busted for sleeping in his driveway , poor sucker left the keys in the ignition to listen to the radio – that was enough for LEO to bust his chops !! Same here… In Iowa, if the keys are in the ignition, they can get you for drunk driving. The most they might nail a person for at the campgrounds around here is public intox… but even then you have to be pretty obnoxious. It’s laid back here… and very remote. I agree with the $10K on the first offense thing. it’s not just the fine but the lawyer, the increased insurance costs, etc. I know a 21 year old that got it for DWI and weed… It’s cost him a fortune… and a 6 month suspension. Wow. Keys in the ignition when you’re parked and you can get busted if you stop to make lunch or BBQ? Whoa. The keys in the ignition thing is if you are drunk… The cops can say you were driving or intending to drive.